Hello. I'm Rory Chasen, and I'm new to Killer Characters, although I suspect I'll be here again, possibly a lot. As long as it doesn't bring me bad luck, of course. Not that I believe in the validity of superstitions. At least, not entirely. I'm skeptical about them, and that's exactly why I happened to venture to Destiny, California, with my wonderful dog Pluckie. You see, my beloved fiancé Warren happened to have died not long after walking under a ladder. Did he die because he walked under it? The ladder didn't hit him, but a car did. Even so, since the superstition exists that it's bad luck to walk under a ladder, I wasn't sure. My good friend Gemma Grayfield suggested that I go to Destiny to check it out, since Destiny is all about superstitions. Not only that, but upon reaching Destiny Pluckie and I were immediately immersed in the possibility of another superstition being true. I intended to visit the Broken Mirror Bookstore on Destiny Boulevard, which was owned by Kenneth Tarzal, author of the premier book on superstitions, The Destiny of Superstitions. However, before we got there Pluckie kept tugging on her leash until I entered the shop next door, the Lucky Dog Boutique. Pluckie led me into the back room, where the shop's owner, Martha Jallopia, was ill and nearly unconscious on the floor. But she said she knew she was going to be okay since she'd been on her way to a business meeting, and happened to just see a very lucky black-and-white dog: Pluckie. Martha soon asked me to run the Lucky Dog Boutique for her. Since my career back home in L.A. had been as an assistant manager at a store in a large pet store chain, I agreed, at least for a while. I liked Martha, after all. And later, when Martha was accused of murdering Tarzal... well, I just had to help clear her. The story of what happened will be memorialized in the book Lost Under A Ladder, to be published in October of this year. Its author Linda O. Johnston has written stories chronicling how murders investigated by other amateurs were resolved, so I'm hopeful that her telling of my story will stick to the facts and not just the superstitions. 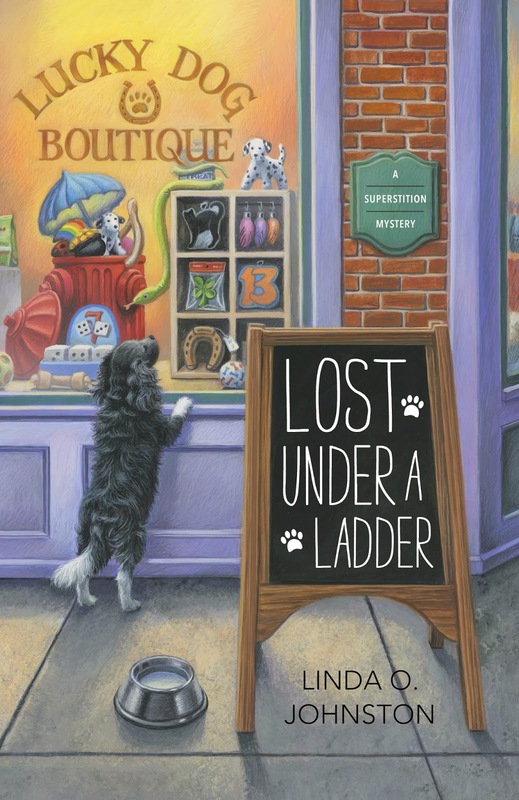 Since Lost Under A Ladder isn't available yet, Linda tells me that she is giving away a copy of TEACUP TURBULENCE, the most recent Pet Rescue Mystery, as part of the Killer Characters Cozy Days of Summer giveaway... She says you should leave a comment before midnight tonight for a chance to win. She also asked me to tell you to be sure to look for the new Pet Rescue Mystery novella CHIHUAHUA CHAOS. It's only $1.99 on Amazon! LOST UNDER A LADDER, the first Superstition Mystery by Linda O. Johnston, will be an October 14 release from Midnight Ink and is available for pre-order now. Eager to read Teacup Turbulence. Great series so far. I love the name. I am sure it will be a great read. I would love to read Teacup Turbulence—thanks for the opportunity to win a copy! This book sounds so good. Had to request it for Kindle. I have read books from the both series actually. I was lucky enough to have been approved to review Under A Ladder for NetGalley. You will find it so captivating. That's great, DelAnne. And thanks! I would really like to win to read this. Sounds great and thanks for the chance to win!! I love reading about murder and superstitions... I wish you even had ARC's available as giveaways for this new series. I own 3 of the Rescue series and 2 of the Kendra books. But beggars (which is what all contest entrants really are) can't be choosers. I'd love any book you offer as a prize. Author is new to me. This new series sounds like fun. Can't wait to read it. I am amassing quite a list of new authors and books to read! Got onto the computer somewhat late in California, and I'm delighted to see so many comments--and entries to win TEACUP TURBULENCE! Rory's excited about it, too, as is Lauren from the Pet Rescue Mysteries. This book sounds like a fun read. Looking forward to reading this one. What an interesting concept for a mystery series. I look forward to checking it out. And I love the Pet Rescue Mysteries. This sounds like a good addition to the choices. Can't wait to read both of them (all three?). Thanks! The Superstition Mystery "Lost Under A Ladder," sounds so original, and with Rory, Pluckie and Martha's descriptions in the post I"m already interested. Love to own Teacup Turbulence, a Pet Rescue Mystery, too as I used to rescue abandoned animals myself. Loved the post! I love the Pet Rescue series, and this sounds great also. Good luck with "Lost Under a Ladder"! Would love to win "Teacup Turbulence". Interesting theme for the new series! Will be checking it out! Thanks for the chance to win. Sounds good. Lost Under a Ladder is an original title. I can't think of any other books with ladder in the title! I love cozies with animals in them. I love browsing through pet stores and getting goodies for my fur kids. Here's to a successful business for you Rory. Knock on wood. This new series sounds great. I love the pet rescue series. This new superstitious series sounds like so much fun! I can't wait! I'm not superstitious, I don't think. Although sometimes when I spill salt I will throw some over my shoulder -- don't know if it's supposed to be over a particular shoulder, I just throw it over the one where I won't hit anyone behind me. And I don't walk under ladders, but that's more from a safety standpoint. Think I might not mind reading about superstitions, so I do want to give this series a look. I cant wait to read this book! Love your books! I'm superstitious already---will reading this book result in me being even more superstitious? Thanks again for all your comments, everyone, and I'm delighted to hear that some of you have been reading my books already. Drawing for the winner will be tomorrow. And for those of you who are superstitious--or think you may be--or aren't sure you're not? Cross your fingers! Thanks for a chance to win. Have not read any of your books yet. They sound great. This is a new series for me. Must add it to my list. Sounds like this is going to be a good book.